Strong winds that blew through North Texas overnight knocked down traffic signals, disconnected power to thousands of residents and caused damage in many areas. The winds blew down traffic signals and Beckley Avenue and Interstate 30, forcing Dallas police officers to direct traffic at the intersection. 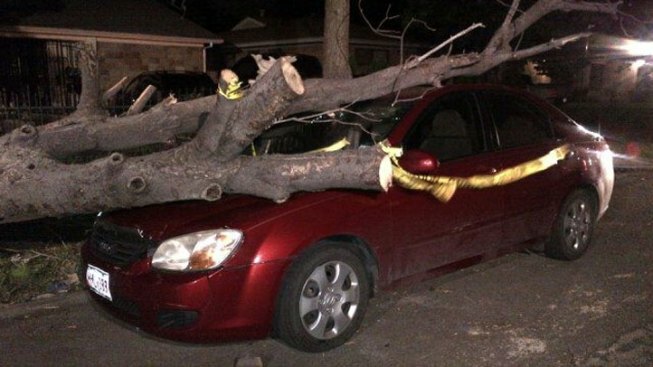 Winds crashed a dead tree onto Melissa Morales' KIA Spectra on Goodyear Drive in Dallas. The tree smashed her windshield and crashed through the car's roof. "I couldn't believe it. I was in shock," Morales said. "I couldn't believe my friend when she called. 'There's a tree on your car.' I couldn't believe it." The owner of the property where the tree used to stand said he was aware the tree was dead and had called the city several weeks ago to have it taken down. A city street department worker that was out cleaning up debris told NBC 5 maintaining the tree is the homeowner's responsibility. Crews cut off the limbs that had been sticking out into the street and taped off the sidewalk while Morales took pictures of the fallen tree trunk for insurance purposes. However, Morales said her insurance expired as of this week. "That's why I haven't driven my car," Morales said. "[The insurance] expired two days ago." Morales said she and the homeowner reached an agreement about covering the damage to the car. At one point, winds gusted over 50 mph in Dallas. Flags and signs on the Margaret Hunt Hill Bridge shook as strong winds passed through the area. As of 4:40 a.m., Oncor's online outage system reported more than 2,000 people were without power after the overnight winds. The system reports crews are out assessing the damage and working to restore power. NBC 5 Meteorologist Grant Johnston said the overnight winds were likely the result of decaying thunderstorm activity west of the North Texas region. Johnston forecasts wind gusts will stay in the 30 mph range throughout the day. But the damaging winds are just one weather worry on Wednesday -- severe weather is expected for some portions of the NBC 5 viewing area later tonight.